The mandocello (Italian: mandoloncello, Liuto cantabile, liuto moderno) is a plucked string instrument of the mandolin family. It is larger than the mandolin, and is the baritone/bass instrument of the mandolin family. Its eight strings are in four paired courses, with the strings in each course tuned in unison. Overall tuning of the courses is in fifths like a mandolin, but beginning on bass C (C2). It can be described as being to the mandolin what the cello is to the violin. 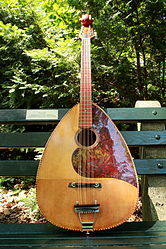 Mandocello construction is similar to the mandolin: the mandocello body may be constructed with a bowl-shaped back according to designs of the 18th-century Vinaccia school, or with a flat (arched) back according to the designs of Gibson Guitar Corporation popularized in the United States in the early 20th Century. The scale of the mandocello is longer than that of the mandolin. Gibson examples have a scale length of 24.75" (62.87 cm) but flat-back designs have appeared with both significantly shorter and longer scale lengths (27"/68.58 cm on some Vega mandocellos). Bowl-back instruments may have a shorter scale length, on the order of 22.5" (about 57 cm). The internal bracing also bears some similarity to the mandolin. Gibson's mandocellos were typically constructed with a single transverse brace on the top just below the oval soundhole. Modern builders also use X-bracing. As is typical of the mandolin family, mandocellos can be found with either a single oval soundhole or a pair of "F" soundholes. These instruments typically have between 18 and 22 frets; concert bowl-back instruments may have more frets permitting virtuoso passage work in the upper register. The mandocello generally has four courses of two strings each. Because of the heavy gauge of the lowest course, some folk mandocello players remove one of the C strings to prevent rattling while playing fortissimo. There is a rare 10-string/5-course mandocello, containing an additional course of strings above the 1st (highest) course, sometimes termed a liuto cantabile or liuto moderno, although these instruments remain technically mandocellos. Like most other instruments in the mandolin family the mandocello originated in Europe. Mandolins evolved from the lute family in Italy during the 17th and 18th centuries, and the bowl back mandolin, produced particularly in Naples, became common in the 19th century. It was during the Baroque period (1600-1750) that interest in the mandolin began to increase, along with its use in ensemble playing, resulting in increased interest in developing and expanding the mandolin family. The first evidence of modern metal-string mandolins is from literature regarding popular Italian players who travelled through Europe teaching and giving concerts. Notable are Signor Gabriele Leone, Giovanni Battista Gervasio, Pietro Denis, who travelled widely between 1750 and 1810. This, together with the records gleaned from the Italian Vinaccia family of luthiers in Naples, Italy, has led musicologists to believe that the family of modern steel-string mandolins were developed in Naples by the Vinaccia family. Mandolin ensembles were popular in the late Baroque period, and a number of instruments were added to the family around this time, including the mandalone a flat-backed, bass instrument, "much larger than the liuto" with "four heavy wound strings" tuned (in fourths) to A2-D3-G3-C4. This instrument may have been the direct precursor of the mandocello. The popularity of mandolin ensembles began to wane during the late Classical (1750-1825) period, and after 1815 the mandolin largely transitioned to the status of a folk instrument, and the mandolone all but disappeared. It was during this decline in popularity that Pasquale Vinaccia (1806–1885) made his modifications to the instrument that his family made for generations, creating the Neapolitan mandolin. The mandolin was largely forgotten outside of Italy by that point, but the stage was set for it to become known again, starting with the Paris Exposition in 1878. Vinaccia modernized several members of the mandolin family, improving resonance, increasing ranges, and adding features. In addition to creating the Neapolitan mandolin c. 1835, he reconceived the mandalone and related instruments, which had limited range, and a much quieter tone than the treble mandolins. The Neopolitan mandocello he developed had increased volume, extended range, and effectively superseded the mandolone as the bass instrument of the mandolin family. This was followed by a wave of Italian mandolinists traveling in Europe in the 1880s and 1890s, and in the United States by the mid-1880s, playing and teaching their instrument. The instrument's popularity continued to increase during the 1890s and mandolin popularity was at its height in the "early years of the 20th century. Thousands were taking up the instrument as a pastime, and it became an instrument of society, taken up by young men and women. Mandolin orchestras were formed worldwide, incorporating the mandolin family of instruments—mandolins, mandolas, mandocellos, and even mandobasses—as well as guitars, double basses and zithers. Around this time, the Gibson company began building mandocellos in the style of their mandolins with arched tops and backs. Gibson is known to have produced at least four models of mandocello between 1905 and the 1920s: the K-1, K-2, K-4, and K-5. Other American instrument companies also produced mandocellos. After the 1930s the popularity of mandolin ensembles once again began to decline, though not as completely as it had in the 19th century. Mandolins continued to be produced, but production of other members of the family decreased significantly, although—with the possible exception of the mandobass—it never died out completely. The average range, therefore, is about three-and-a-half octaves, with the exact range depending on the number of frets on the individual instrument: from two octaves below middle C up to D#5/Eb5, in the octave above middle C, (with 18 frets), to as high as A5, with 24 frets. On 10-string/5-course instruments an additional string-pair, placed above the first course, is tuned to E3 E3, adding an additional half-octave or so to the upper range. The bowl-back mandocello is chiefly used in mandolin orchestras and mandolin quartets, where it provides a melodic and bass role similar to the cello in a bowed string quartet. It is occasionally used as a solo instrument for the performance of classical music, such as concertos and unaccompanied repertoire originally composed for solo cello. However, some pieces specifically for liuto cantabile were composed by Raffaele Calace, who championed the instrument in the early 20th Century. The mandocello also has a role in modern folk music, such as bluegrass or Celtic music. In this setting the flat-back mandocello is typically used. The mandocello's lower range does not produce the bright, projecting sound of the mandolin or mandola, and its use in this setting has been generally eclipsed by mandolin artists since Bill Monroe. The amplified instrument has infrequently been used in modern rock music groups. The bowl-back mandocello (mandoloncello) is traditionally used for Italian folk music. The most historically significant mandocellist was Raffaele Calace, who wrote the first method book specifically for liuto cantabile, and is thought to have perfected the design of the instrument following its putative introduction by the Vinaccia family. Luigi Embergher also contributed significantly to advancements in the design of the instrument during the late 19th and early 20th centuries. Accomplished artists specializing in mandocello performance in 21st century America are relatively few in number, and only a modest number of contemporary recordings prominently feature the instrument. One American mandocello artist, Stanley Greenthal, is a specialist in the music of Brittany and an instructor at Zouk Fest. The mandolinist Radim Zenkl is also well known for performances of American, Italian, and other European folk music on the mandocello. One recent recording with mandolin virtuosos Carlo Aonzo and David Grisman has featured Zenkl's mandocello on the album of Italian folk music "Traversata" published by Acoustic Disc. Steve Knightley of the English folk-rock band Show of Hands plays the cello-mandolin, however his instrument is tuned GDAD, similar to an octave mandolin. Mike Marshall, best known for his collaborations with David Grisman, Darol Anger and Chris Thile has performed and recorded frequently with the mandocello. Geoff Goodman, New York born European jazz musician and composer, features both guitar and mandocello in his compositions. Patterson Hood, front man for Drive-By Truckers, plays a mandocello made by Scott Baxendale of Baxendale Guitars in Athens Georgia. Baxendale starts with a vintage Harmony guitar and converts it from six string standard tuning to the mandocello. Rick Nielsen of the band Cheap Trick has a stringed instrument collection that includes electric mandocellos custom made by Hamer Guitars. 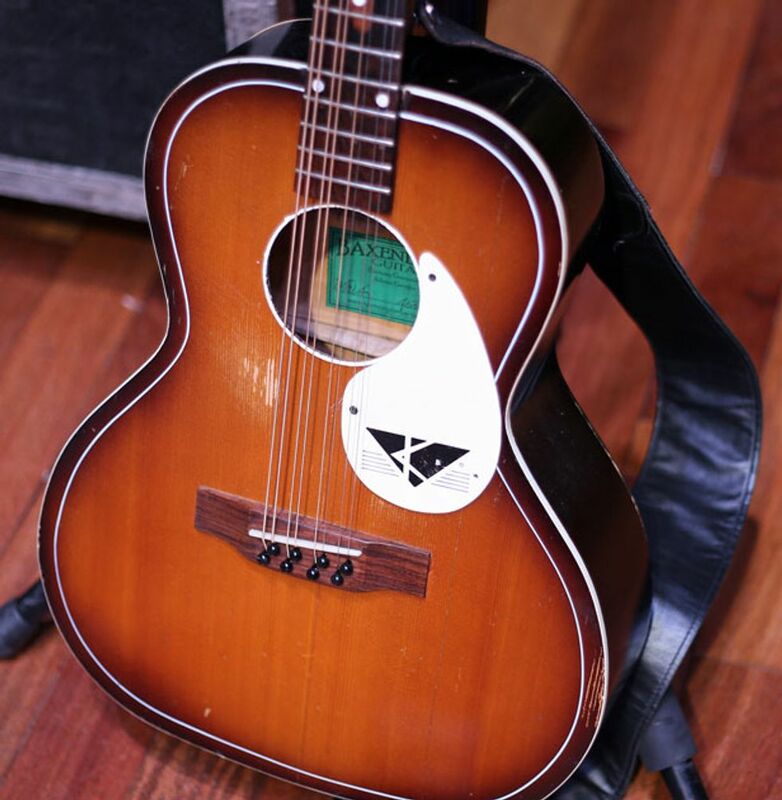 Such an instrument was used for the title track from their LP Heaven Tonight, while their song "Mandocello", released on the band's debut album, used a standard acoustic mandocello. This song was later covered by Concrete Blonde and released on their album Still in Hollywood. Jaco Pastorius, bassist for Weather Report, overdubbed a mandocello on their hit "Birdland." Richie Sambora, guitarist for Bon Jovi, used a mandocello on the song "Lay Your Hands on Me" from their acoustic album This Left Feels Right. ^ Paul Sparks, The Classical Mandolin, Oxford University Press, pages 205, 206. ^ Ian Pommerenke, The Mandolin in the early to mid 19th Century, Lanarkshire Guitar and Mandolin Association Newsletter, Spring 2007. Richards, Tobe A. (2006). The Mandocello Chord Bible: CGDA Standard Tuning 1,728 Chords. United Kingdom: Cabot Books. ISBN 0-9553944-3-0. A comprehensive instructional guide. Loesberg, John (1998). Chords for Mandolin, Irish Banjo, Bouzouki, Tenor Mandola, Mandocello. Cork, Ireland: Random House. ISBN 0-946005-47-8. OCLC 42276844. A chord book featuring 20 pages of popular chords. Patterson Hood's Converted Baxendale Mandocello.